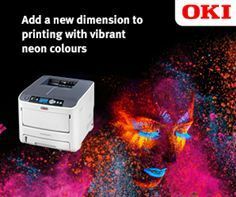 Egham, 5 April 2016 – OKI Europe Ltd is taking printing to the next level for creative businesses and print houses with the launch of the new Pro6410 NeonColor printer and introduction of award-winning white toner technology, to its Pro Series range of Graphic Arts printers. Enabling the printing of super-bright, eye-catching fluorescent designs on transfer media for use on almost anything, the Pro6410 NeonColor liberates graphic designs from the limits of the standard CMY colour spectrum. For further information visit www.okieurope.com.